Leicester City capped off an emotional afternoon by joining their fans in paying tribute to late chairman Vichai Srivaddhanaprabha after their 1-0 win at Cardiff City in the Premier League on Saturday. Srivaddhanaprabha was killed along with Nusara Suknamai, Kaveporn Punpare, Izabela Roza Lechowicz and pilot Eric Swaffer when the helicopter they were travelling in appeared to lose control shortly after taking off from the King Power Stadium following the 1-1 draw with West Ham. A scheduled EFL Cup clash with Southampton on Tuesday was postponed, with Leicester players – who paid tribute to the 60-year-old at the ground this week – returning to action in the Welsh capital on Saturday. A goal from Demarai Gray 10 minutes into the second half gave the Foxes the lead and sent the players and visiting fans into wild celebrations and proved enough to give them the three points. Emotions bubbled over as the Leicester players made their way over to applaud their supporters, with many carrying signs expressing their gratitude to Srivaddhanaprabha. Some Leicester players huddled behind a banner that depicted the chairman holding the Premier League trophy with “Thank you, Vichai” written on it, while Marc Albrighton waved a picture of the chairman that said “Walk for Vichai”, and James Maddison had “R.I.P. Boss” across his t-shirt. “I feel proud,” goalkeeper Kasper Schmeichel told Sky Sports . “It’s been a really tough week for everyone. The way everyone at the club has handled themselves is a testament to the family that Vichai built. “The win took a lot out of us, that was tough, but I’m so proud of how everyone played, how professional it was. It was always going to be an emotional day. “I think you come across very few people that really impact you. He had a really big impact on my life. You can see from the reaction of everybody that he had an impact on so many lives. He’s a man we’re immensely proud of, immensely proud to have known. Schmeichel appeared particularly emotional as he was at the front of the tributes earlier in the day, too. The Danish goalkeeper led the team and background staff into a huddle after they gathered around the centre circle for a minute’s silence before the match kicked off. Claude Puel’s men warmed up for the match in t-shirts that bore Srivaddhanaprabha’s face, along with the message: “You will be forever in our hearts”, and many supporters wore the same shirts, while some were draped in Thai flags for the trip. As the players emerged from the tunnel, both sets of fans unfurled giant banners bearing the words “RIP Vichai”, with Cardiff supporters passing theirs to their Leicester counterparts in a show of unity. An emotional minute’s silence has been beautifully observed by Leicester City and @CardiffCityFC fans in south Wales for our late Chairman, Vichai Srivaddhanaprabha, and those who sadly lost their lives last weekend. After the win, Leicester are set to fly to Bangkok to attend Srivaddhanaprabha’s funeral following the match. Meanwhile, Brighton’s Anthony Knockaert, who spent three years at Leicester, had his own tribute before his side’s game at Everton. 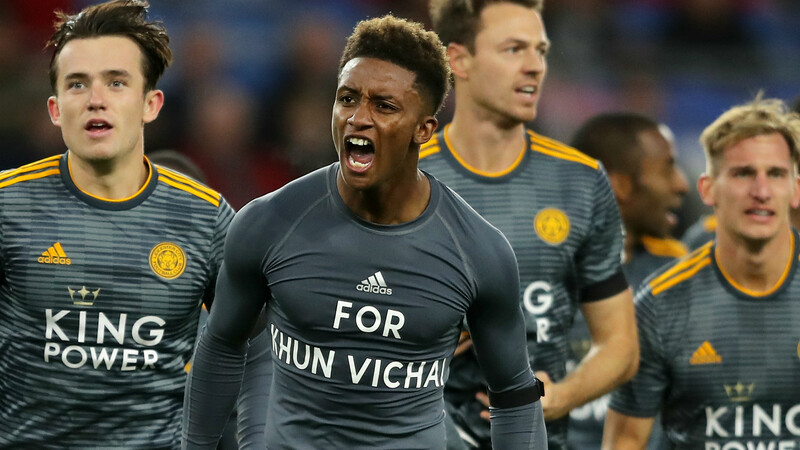 During the warm-up, the winger wore a t-shirt that had “Thank you Vichai. I will miss you. R.I.P” written on the back.